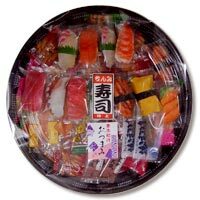 We did it in the package of the finger sushi to have you enjoy an edible cake and delicacy as tidbits at parties in Japan. we make Kaki-no-tane snack, hail, a dried cuttlefish, a dried potato, tuna cuts of pork boiled with sugar, soy sauce, sweet sake and salt, the dried fish of the small fish a set. Please in the seat of the liquor.